Read about the London (UK), Brussels and Kuala Lumpur events that took place in January 2019. 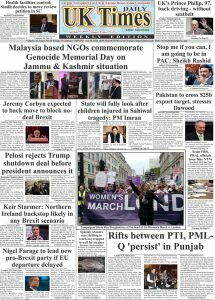 Genocide Memorial Day took place in three main centres this year in the UK, Belgium and Malaysia. 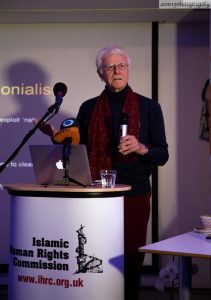 Below is an overview of the London (UK) event organised by IHRC, and short summaries of the Brussels and Kuala Lumpur events, organised by the Brussels Panthers and MAPIM respectively. GMD has been supported and promoted throughout the Decolonial International Network and the Universal Justice Networks every year. 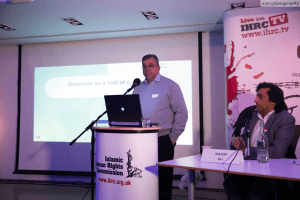 On Sunday, 20 January 2019 Islamic Human Rights Commission (IHRC) held at the P21 Gallery its annual Genocide Memorial Day event for the 10th year running since its inception in 2010. The philosophy of Genocide Memorial Day is to remember “man’s in humanity to man” through raising awareness of genocides and genocidal acts that have taken place and are still taking place around the world. 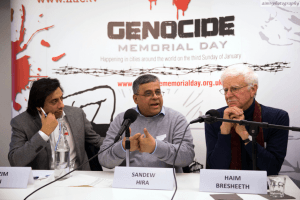 This year’s Genocide Memorial Day theme was “Genocide as a Tool for Colonialism” and particularly, examined the current genocide and ethnic cleansing in Palestine. Watch the videos of the event here or continue reading a report of the event below. The conference was opened by Mr Sayed Jalal Massoumi who recited different verses from Surat An-Nisa and Ash-Shuraa followed by English translations. Once more this year, Nazim Ali chaired the two sessions. 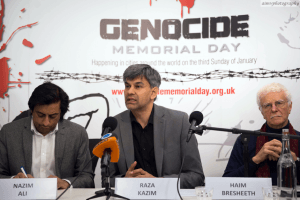 The conference opened up with a message from Raza Kazim, Head of of the GMD project, who explained that Genocide Memorial Day was initiated to eradicated genocide and genocidal acts and the culture that led up to genocides. This year’s theme has been chosen to spotlight how colonial powers are continuing their colonial genocidal policies but covering up their involvement. Kazim also spoke about avoiding the creation of a hierarchy of victim when we discuss the act of public commemoration of genocide, which is the underlying philosophy behind GMD. He emphasized on ‘Why Genocide Memorial Day’ is an important day to remember the deaths of the many victims of genocides across the world and throughout history who are not widely known. Nazim Ali introduced the first speaker, Haim Bresheeth, who is a scholar, filmmaker and photographer and currently teaches at the School of Oriental and African Studies (SOAS). Professor Bresheeth has written several books, included the best-selling ‘Introduction to the Holocaust’ -with Stuart Hood. Moreover, he has filmed numerous documentaries including the widely-shown ‘State of Danger’ (1989, BBC2) – a documentary on the first Palestinian Intifada as well as his new film -with Yosefa Loshitzky- ‘The Last Honeymoon in Europe’ which was premiered at the Open Space Gallery in Vienna, as part of the Lost in Europe exhibition. Bresheeth, the son of two Nazi concentration camp victims, made a fascinating and unique contribution, beginning his speech by showing pictures of his father emaciated in a concentration camp. He addressed the links between genocide, colonialism and racism, explaining in detail that these three connections are very important to understand genocides. He went through types of colonialism, highlighting the idea that there isn’t colonialism without violence with ethnic cleansing the last stage before genocide occurs. Bresheeth added that the British colonial system is probably the most murderous because it hasn’t killed people in one way but it has killed people in so many ways. He stated that the sons and daughters of Holocaust victims in the Israeli apparatus are perpetrating genocide against Palestinians, and that a genocide is planned by the Israeli government for the total decimation and ethnic cleansing of Palestine. Before the first panel ended, Narjis Khan, a poet and lawyer with expertise in human rights, international law and private litigation, performed a powerful poem entitled “Fascism”. She described that fascism has not been defeated and is very much alive today with the same narrative of hate. Read her poem on her blog here. Before the break and prayers, Khan promoted the IHRC’s annual poetry competition for children aged 11-18 encouraging students to submit the entries before December 1, 2019. The final speaker was Sandew Hira, director of the International Institute for Scientific Research (IISR) in The Hague. Hira has published a book series entitled ‘Decolonizing the Mind’ with Amrit Publishers and is coordinator of the Decolonial International Network (DIN). Hira began his lecture defining colonialism as “a global system of economic, social, political and cultural institutions that organise the world into two main parts: the colonised part that is exploited and oppressed in order to serve the economic, social, political and cultural interests of the colonisers part”. From this definition, he clearly explained the role of genocide in colonialism being racism a key instrument of genocide. Hira also addressed why reparations are a crucial part of Genocide Memorial and restitution. After Sandew’s presentation, attendees were given the chance to discuss with both speakers some of the issues raised in the conference. Reparations was one of the topics that speakers focused on. Bresheeth and Hira pointed to the value of human life and how damage produced by genocides should be repaired in many ways. Bresheeth explained how Zionism as a colonial movement is very sophisticated and which uses the suffering of its own people as well as the suffering of others. The final message from speakers and audience was for all people to come together to defend the rights of all against power, atrocities, discrimination and genocide. The winners of the annual poetry competition for children ages 11-18 were announced by Nazim Ali who explained that the judges were genuinely impressed by the creativity, emotion and depth of the entries submitted. Poppy Crossland was the winner of the first prize for ‘The House’. She wins an all-expenses paid trip to Bosnia with an accompanying adult. The two second prizes consisted of a £50 IHRC bookshop voucher and the certificate of achievement which were awarded to Jasper Bardsley for ‘Genocide Through History’ and Elise Scotney for her poem ‘The Calm Before the Storm’. The two third prizes, a £25 IHRC bookshop voucher and the certificate of achievement, were awarded to Joshua Couchman for his poem ‘So Great is Humanity’ and Saba Ahmadzadeh-Noughani for ‘I still remember the days’. Before the event came to a close, Nazim Ali read out loud the different genocides that have happened across the globe followed by one-minute silence to remember those who lose their lives. This part of the event has become a regular feature but hearing it every year does not lessen the impact. Finally, Massoud Shadjareh, chair of the IHRC, concluded the conference by thanking the hugely varied attendees and volunteers for their efforts to make possible this annual event. He highlighted the importance of remembering together, with people from different backgrounds and beliefs, to stop this madness which is happening in our time and find remedies and solutions for the future. Moreover, Shadjareh mentioned how weapons of mass destruction and starvation are tools being used nowadays as a form of genocide, with the siege of Gaza an example of one of most terrible ongoing genocides. The event was also live streamed to engage and include a global audience. All the videos have been uploaded onto IHRC’s youtube channel at youtube.com/IHRCtv. You can also watch all the videos of the London event here. A gallery of photos for reuse with attribution can be found here. GMD in Brussels took place on 18 January 2019. Brussels Panthers organised a conference on “What Belgium owes to Kongo”. Speakers for the event were Sandew Hira, Director of the International Institute for Scientific Research (IISR), Véronique Clette-Gakuba, researcher at ULB, Toma Muteba Luntumbue, art historian and Martin Vander Elst, researcher at the Laboratory of Prospective Anthropology (UCL) who spoke on how the slave trade and slavery remains alive today and how these crimes were perpetrated by the “civilized nations”. Watch the video of the event below. GMD in Malaysia took place on 20 January at Selongor International Islamic University. This year the theme was ‘Genocide in Indian Occupied Jammu and Kashmir’ being the main goal to highlight the incessant plight, denial of right to life, ethnic cleansing and genocide of Kashmiri Muslims at the hands of Indian occupying forces. The High Commissioner of Pakistan, Mohammad Nafees Zakaria was invited as a guest speaker and said that the choice of theme reflected the deep concern and understanding among the Brethren in Malaysia over challenges confronted by the Muslim Ummah, particularly the Kashmiri people in Jammu and Kashmir under Indian occupation. The event garnered mainstream media attention. Read the declaration from the event below. Malaysian Consultative Council of Islamic Organization ( MAPIM) organized Genocide Memorial Day (GMD) event, today, at Selongor International Islamic University College, Malaysia. This year the theme topic was Genocide in Indian Occupied Jammu & Kashmir. MAPIM is an umbrella organization of 200 Islamic NGOs, which focuses on humanitarian relief, education, socio-economic upliftment , da’wah and human rights advocacy. The GMD is an annual event organized by MAPIM to raise public awareness especially amongst the youth. This year, the objective was to highlight the incessant plight, denial of right to life, genocide and ethnic cleansing of Kashmiri Muslims at the hands of Indian occupying forces. The High Commissioner of Pakistan, Mohammad Nafees Zakaria, was invited as guest speaker . The High Commissioner appreciated the organizers MAPIM‘s constant support and solidarity with Kashmiri Muslims in IOK and their concern over the grave human rights situation there while referring to the event organized by MAPIM on Kashmir and their strong condemnation last month on Pulwama killings and choosing Kashmir as the theme for the ‘Genocide Memorial Day’. He said that the choice of theme reflected the deep concern and understanding among the Brethren in Malaysia over challenges confronted by Muslim Ummah, particularly the Kashmiri brothers and sisters in Jammu & Kashmir under Indian Occupation. The High Commissioner said that the dispute of Jammu & Kashmir is internationally recognized. There are UN Security Council resolutions that call for a UN supervised plebiscite to enable Kashmiris to exercise their right of self-determination. He regretted that the UN Security Council & UNCIP Resolutions on Jammu & Kashmir dispute remain unimplemented for seven decades, which have made Kashmiri Muslims to suffer. He said that the Government of Pakistan extends diplomatic, political and moral support to the Kashmiris and wishes to resolve this longstanding Dispute in accordance with the relevant UN Security Council Resolutions on Jammu& Kashmir, which call for Kashmiri people to exercise their right to self determination under a UN supervised plebiscite. Highlighting the arbitrary arrests and disappearances, he said that in 2009, a Jammu & Kashmir NGO in IOK, International People’s Tribunal (IPTK), issued on thousands of unnamed and unmarked mass graves, which the Association of Parents of Disappeared Persons (APDP) and IPTK discovered. Referring to the Amnesty International ‘s appalling account entitled: ‘Losing Sight in Kashmir – The Impact of Pellet Firing Shotguns’, the High Commissioner said that since 9 July 2016, Kashmiri youth are being targeted. Hundreds of defenceless students, girls and boys, young men and women, and even children, have been martyred, and over a thousand have been blinded, either fully or partially, by the use of pellet guns. Tens of thousands were injured, some critically while medical facility was denied simultaneously to aggravate their pain. Each account of Amnesty’s report of pellet victims is a story of pain, expression of helplessness and reflection of life full of darkness, he said. Mr. Zakaria presented the salient points of the 14 June 2018 issued by Office of the High Commissioner for Human Rights (OHCHR) on 14 June 2018, which inter alia called for an independent inquiry commission’s visit to Kashmir. Report has highlighted ‘Lack of access to justice and impunity. The OHCHR Report termed the use of pellet guns as the most dangerous weapon, he underlined.The High Commissioner informed the audience about deep concerns echoed in the House of Commons of the UK, where extensive debates were held in September 2010 after the discovery of unnamed Mass Graves, in September 2014 and January 2017. The Atrocities and human rights violations were also echoed on the platform of All Parties Parliamentary Group on Kashmir of the House of Commons, of late. Pakistan has been highlighting the sufferings of the oppressed Kashmiris in IOK to the UN, OIC, human rights and the world community to help end daily killings and call the perpetrators to account for and crimes against humanity committed with impunity, he emphasised. The High Commissioner emphasized that the bloodshed in Indian Occupied Kashmir must stop immediately and unconditionally and that Kashmir issue must be resolved on priority. President MAPIM expressed concern over the sufferings of Muslims across the globe. He was dismayed over the silence of the international community over the atrocities committed in Kashmir by the Indian occupation forces. He committed to MAPIM’s steadfast support to the Kashmiris in IOK. Declaration on ‘ Genocide Memorial Day 2019’ was issued at the end of event. The Declaration condemned genocide of Kashmiri people by the Indian occupying forces.